to explain the decay of radioactive elements. in the periodic table between uranium and lead. but impossible to separate chemically. or is the element variable? 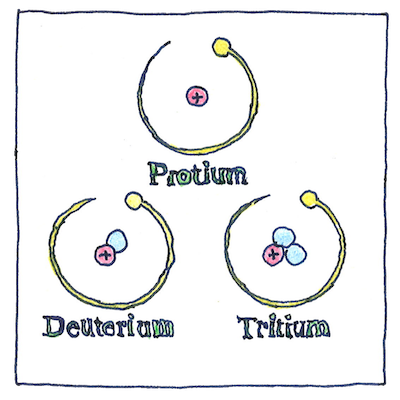 The number of protons in an atom, known as its atomic number, determine what element it is. An isotope is an atom with a different number of neutrons, and an ion is an atom with a different number of electrons. Atomic masses are measured in units where 1 is equal to the total mass of one proton, one neutron, and one electron in carbon-12. The mass number of an atom is the sum of its protons and neutrons (both known as nucleons). The element name and mass number identify the isotope. For example, the atomic number of carbon is 6, and the carbon-14 isotope, abbreviated as 14C, has 6 protons and 8 neutrons. Only 80 elements have stable isotopes, the rest having only radioactive isotopes. Tin, atomic number 40, has the largest number of stable isotopes, ten, with mass numbers 112, 114 through 120, 122, and 124. Tin-124 has 40 protons and 84 neutrons. If you are talking about various atoms that occupy the same place in the periodic table, you use the term isotope. If you are talking about various nuclei with the same number of protons, you use the term nuclide. It turns out to be an urban myth that Eskimos have 100 words for snow, but it is true that Americans have at least 100 words for stupidity.